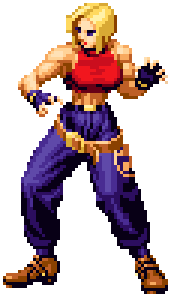 Blue Mary (ブルー・マリー), whose real name is Mary Ryan (マリー・ライアン) was born in the city of Southtown. She grew up with only her father in her life. With his time consistently taken by his occupation, however, Mary turned to learning the arts of Commando Sambo strongly influenced by her father who was a police officer of the city. Seeing the society that her father worked in made her also realize the reality of crime and injustice in the world. One day as she was working undercover, a mysterious benefactor (Geese Howard) requested her services to enter the King of Fighters tournament, along with the two criminals Billy Kane and Ryuji Yamazaki. During the outcome of the tournament, it was discovered that Yamazaki had become more and more insane due to the Orochi blood coursing through his veins and that Billy was sent by Geese to keep an eye on him in order to learn the secret of the Orochi power. However, during a moment of confusion, Yamazaki escaped and Mary was left to ponder on Geese's motives and the root of the situation. Realizing that she's been tricked, she abandoned the Outlaw Team looking for better partners for the next KOF Tournament. This page was last edited on 18 January 2009, at 14:26.